From March 25 to March 29, 2018, Etruscan Press author Aaron Poochigian visited Wilkes-Barre, PA to record the audiobook of his debut novel-in-verse, Mr. Either/Or (Etruscan Press, 2017). The recording sessions were completed at WCLH, the Wilkes University campus radio station facility located in the Karambelas Media and Communication Center. Mr. Either/Or is a melding of American mythology, noir thriller and classical epic in language in which gritty rhythms, foreboding overtones and groovy jams surround the reader like an atmosphere. Imagine Byron’s Don Juan on a high-stakes romp through a Raymond Chandler novel. Think Hamlet in Manhattan with a license to kill. The audiobook will be available at Audible.com next month. 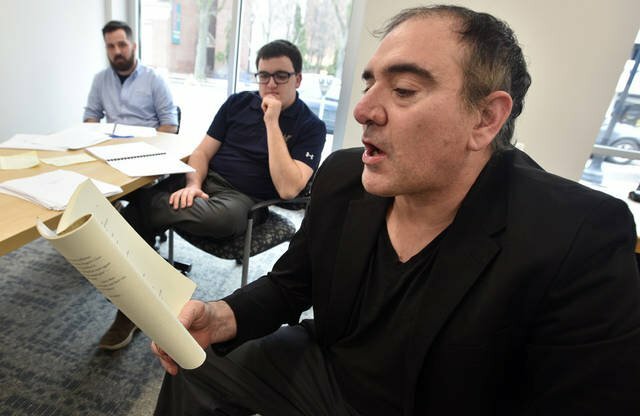 In between recording sessions, Poochigian observed Wilkes instructor Bernie Kovacs’ poetry writing workshop, conducted a reading from Mr. Either/Or, and was interviewed by local newspapers The Citizens’ Voice and The Times Leader. In between takes, he took some time out to explain his early love of poetry and how this love came full circle in the recording of his book. This is the first time an Etruscan author has recorded an audiobook at WCLH, and Poochigian expressed enthusiasm over the opportunity to be involved in this partnership. He says, “Every day I become still more grateful that I decided to publish Mr. Either/Or with Etruscan Press. I had big ambitions for the book, and Etruscan has found ways to bring all my plans to fulfillment, both in terms of publicity and, now, through this audiobook. Three days I worked with sound-technicians at Wilkes. It was an exciting (and at times grueling) process, especially because our standard was perfection. I am happy because I have left them with a recording of the book as I wanted it to be read.” As far as post-production, the Wilkes recording team will now turn to adding another dimension to the work through refinements such as ambient sounds—big city noises, cheering crowds, horns, and gunshots. Pamela Turchin is pursuing her M.F.A. in fiction from Wilkes University, where she serves as a graduate assistant and as the production editor at Etruscan Press. We are proud to welcome Karen Donovan’s book Aard-vark to Axolotl to the Etruscan Press family. 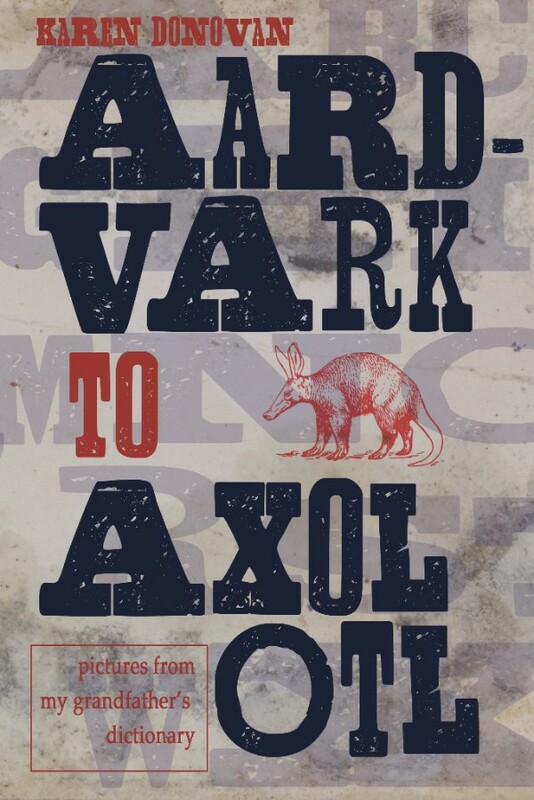 Aard-vark to Axolotl is a collection of tiny stories and prose poems based on a set of illustrations from the pages of Donovan’s grandfather’s 1925 Webster’s New International Dictionary. She created a new narrative context for each dictionary entry. The pages include vintage dictionary engravings for entries involving plants, animals, science terminology, spirituality, devices, and more. Her mother had owned the dictionary for decades and had tucked it away in a chest, forgetting all about it. When the author came into possession of the book, it captivated her. The dictionary became a type of connection to her grandfather, and helped Donovan create a book that is more than meets the eye. Aard-vark to Axolotl is a fun page-turner that keeps you smiling through pages of reimagined definitions. United Airlines employees Jen Ruffini and Bob Di Rice, founders of "Books on the Fly." 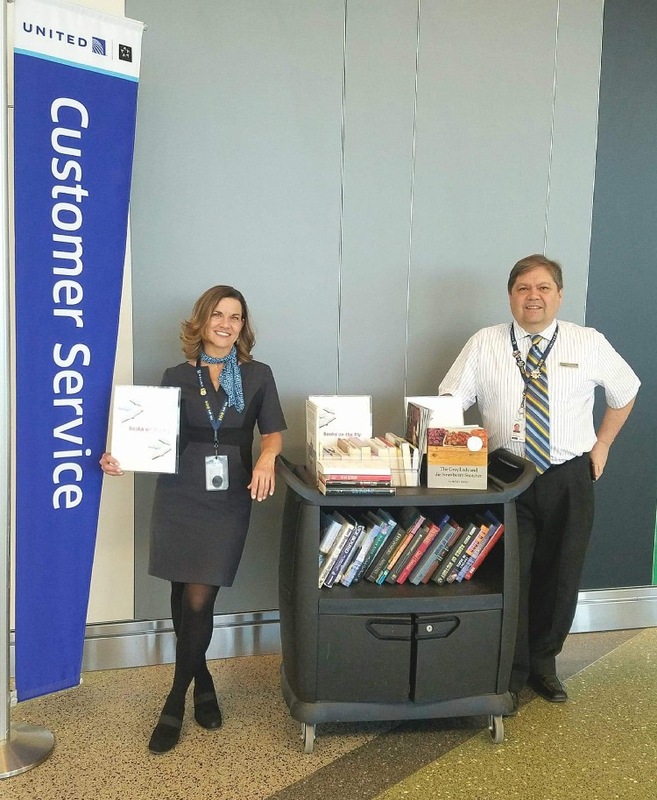 In March 2018, Etruscan Press and Wilkes University joined United Airlines Books on the Fly, an outreach partnership at Boston Logan International Airport that allows United customers to select books to read on cross-country flights. The outreach initiative now includes books donated by Etruscan Press and faculty from the Maslow Family Graduate Program in Creative Writing at Wilkes University. This literary partnership represents the strong commitment to community by Etruscan Press, United Airlines, and Wilkes University. Boston customer service representatives Jen Ruffini and Bob Di Rice noticed that books brought in by United employees began to pile up in the break room. They began to take these books and offer them to passengers on cross-country flights, and it has been a success. They’ve named their program “Books on the Fly,” and they offer about 40 books of varying genres on every flight, ensuring there is something for everyone to read. Di Rice says he believes they’ve given away more than 1,500 books, which have all been donated by employees, customers, and now Etruscan Press. This program has “taken off” now that United has designated an Etruscan “wing” on the mobile book cart.